This market has truly become a snoozer - there have only been a few times when I can remember such little intraday volatility day after day (after day, after day). I don't know if the economic data matters much nowadays since everyone is convinced 2011 is smooth sailing ahead so anything bad people can say is either backwards looking or will mean QE3 is assured, and anything good is ... good. Hence, investors are having it both ways right now in the 'can't lose' market. With the 4 month sprint up, many people are now calling for a pullback right after the new year - but with so many people calling for that one wonders if it will be just that easy. Especially with the data that is surely to be positive next week. Maybe it will be a few weeks later when earnings season begins - many stocks are now priced for perfection so if perfection is not shown in the earnings period, we could see selloffs - see Nike (NKE) a few weeks ago. As you know by now the first day of the month is now almost always a winner... so I'd assume the fund inflows that drive the first day of the month will only accelerate on the first day of the year. Plus China reports its Purchasing Managers Index ahead of the our open Monday and we have also now construed the Chinese to be perfect. If the data is strong, we say "China is still on track - just booming!".... if the data comes in weaker, we say "China is doing an excellent job of cooling down its inflationary conditions!". Once more, a "can't lose" psychology. 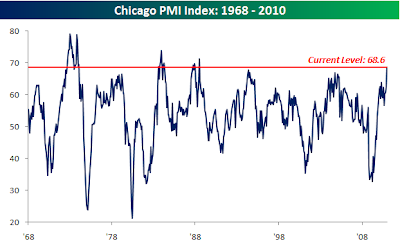 Yesterday's Chicago Purchasing Managers Index was the best it's been in 20 years which should bode well for the ISM Manufacturing figure next week. Granted manufacturing employs less than 10% of the U.S. workforce nowadays, but people still treat this report as if we are living in 1975. ISM Non-Manufacturing is more important to today's workforce ... it has been lagging the manufacturing index throughout the recovery but has shown better the past 6 months than the first year+ of the 'non recession'. The other big report of the week is Friday's monthly jobs data - if you recall last month's was a complete outlier [Dec 3, 2010: Quite a Disappointment - November Figures +39K Jobs, Unemployment Rate +9.8%] so I'd expect a big revision upward to the November data and decent data in December. This economy needs to be churning out 250K-350K jobs to really begin to make a dent in the unemployment rate but for the market any figure over 0 seems enough. But frankly with the government feeding money into the hands of Americans (another leg of this begins next week as the 2% payroll tax kicks in) and no one worried about the double dip now beginning in housing - these are not big concerns to the market. Technically this sideways action has consolidated the big move from late August and helped to work off overbought conditions - so as long as the 'can't lose mentality' continues we could see another leg up as a multitude of reports hit next week. Bears will want to see a non reaction to good news as their chance to possibly have a moment in the sun i.e. 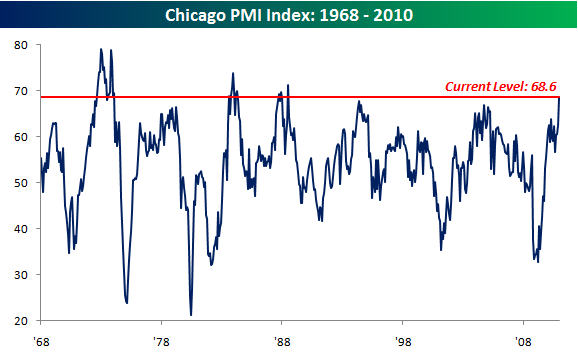 yesterday's blockbuster Chicago PMI did not budge the market (granted it was a holiday session). Once good news fails to move the market, we should believe it's finally been discounted. At this point we are discounting Goldilocks.